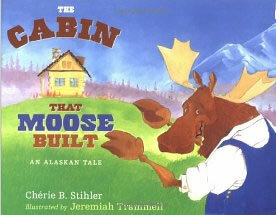 The Cabin that Moose Built by Cherie B Stihler is a great book for kids or parents who like woodworking. The book is mainly a growing poem about a moose and his friends who are trying to get a cabin built before winter. It covers most of the phases of construction in a simple way, from layout, to walls, to electric. plumbing, and painting and wallpapering. The artwork is great in that it shows a fox using a chisel, a bear using a drawknife, and many others. And of course there is a healthy dose of hammering. The reading age is 4-8, but my two year old enjoys having it read to him and pointing to all the tools the animals are using. For a woodworker’s kid, it will bring a lot of smiles and good opportunities to talk about tools and expand the story. My son often relates parts of the book back to me when we are in the workshop together. I was using the drawknife the other day and he said, “Daddy’s using drawknife … like da bear does.” This sentence alone made every penny spent on the book instantly worth it.